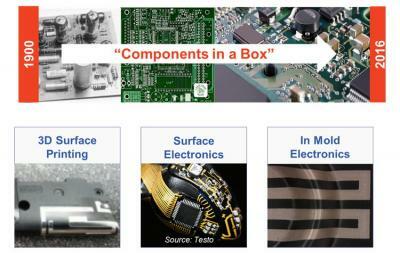 Printed electronics has been in development for over fifteen years. After the initial enthusiasm, broad exploration and learnings from failures the industry enters 2017 with a strong focus on several key themes. These feature as some of the highlights at the key conference and exhibition for the industry – Printed Electronics Europe, which will be held in Berlin on May 10-11 2017 (www.idtechex.com/peeurope), featuring over 225 speakers and over 200 exhibitors. The event is hosted by IDTechEx, the impartial technology scouting and analyst firm that brings the most relevant topics together for you at one event. In this article IDTechEx lists just three of the hottest sectors in printed electronics. Many set out in printed electronics with the expectation that they can make cheaper devices using the technology, due to the lower manufacturing cost and (potentially) lower material cost. In reality, in the short term R&D efforts require pharmaceutical-like pricing to recoup initial investment in new materials and equipment. The performance is also varied – in some areas the technology outperforms the incumbent technology, such as OLEDs versus LCDs, in other areas that is not the case such as printed transistors. Generally speaking, today printed electronics can offer more performance for more money or same performance for more money. Competing on cost as the only differential can be difficult, as the incumbent has more leverage to reduce cost. Rising from this has been the focus to create value beyond cost reduction including thinness, light weighting, robustness, stretchability, larger area, wider substrate compatibility and flexibility. It is these parameters that have resulted in billions of dollars being poured into flexible display development – whether OLED, LCD or other reflective display technologies. The battle is mainly in differentiating consumer electronics products with thinner, curved displays. Covering these innovations on flexible displays and lighting include Sharp, OSRAM, ITRI, OLED Works, Clearink, Etulipa, Folium Optics and FlexEnable at the event on 10-11 May. Others cover the latest progress with flexible sensors, e-textiles, batteries and devices including PragmatIC Printing, Interlink Electronics, ISORG, Flex, Holst Center, Joanneum Research. In 50 years from now, PCBs (printed circuit boards) will be considered as backward as the vacuum tube computing of the 1960’s is considered now. The transition, full of opportunities for companies to grasp now, is to structural electronics - that is putting the electronics and electrics on the device structure, as opposed to using the structure to cover the separate board of electronics. In some cases this can involve the electronics not just being functional circuits but also being load bearing. There are many different approaches to structural electronics, from 3D printing electronics to in mold electronics. Featured speakers covering this topic at Printed Electronics Europe include Fiat Research Center, TactoTek, DoMicro, NovaCentrix, Optomec, TNO and many more. Printed electronics is not just one product type but includes a broad range of enabling technologies at different points of commercialisation and maturity. The increasing trend is hybrid electronics, using printed of flexible technologies for some aspects such as the sensor or battery or display and conventional electronics such as silicon ICs. Here the challenges include assembly automation of different shaped components , particularly where they can be thin and flexible and are being placed on something thin and flexible at high speed. Then there are opportunities to be grasped in connecting these together at low temperature and reliably. These are among the topics covered at the event in the session on hybrid electronics featuring speakers such as Jabil, X-Celeprint, Fraunhofer EMFT, NanoDimension, IMEC and Google. These, however, are just a glimpse at some of the sessions with the full agenda now live at http://www.idtechex.com/printed-electronics-europe/show/en/agenda and covering sectors including energy harvesting, energy storage innovation, printed electronics manufacturing, new material advances and much more. Overarching all of this however, are the diverse range of end user companies presenting at the event, covering their needs and experiences and therefore the market demand. Speakers include Coca-Cola, Jaguar Land Rover, GSK, ARM, Google, VF Global Innovation, JC Decaux, Toyota, Rolls-Royce and many more. See the live agenda now for full details at http://www.idtechex.com/printed-electronics-europe/show/en/agenda. What is printed electronics and how it relates to OLEDs?